If you haven’t heard about CAMplete TruePath, then you probably aren’t really using a 5-axis machine. 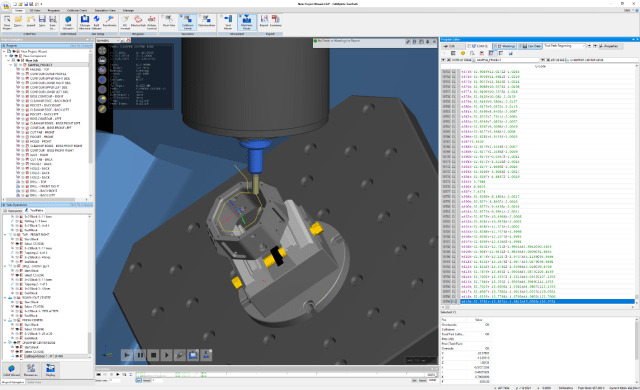 CAMplete TruePath is a software suite of tools created to make it a lot easier to transition from your CAM system to 5-axis machines. Basically, this means users leverage CAMplete TruePath to output NC programs in a customized way. CAMplete TruePath achieves this primarily through its customizable post-processor and its 5-axis simulation, visualization and verification tools. What saves machinists and job shops the most money and time is really understanding how your 5-axis machine will make cuts before you feed it any finalized G-code. Redesigning the user interface for TruePath 2018 for more efficient workflows from CAM systems to 5-axis machines allowed software engineers at CAMplete Solutions to add enhancements to distinctive features. 1. Improved Program Editor: User navigation sees a boost in performance in the latest version because current simulation locations have been programmed to be shown in the editor. The Program Editor also works vertically now, which maximizes the use of screen space, making it more efficient for the user. Reporting of command lines that contain errors is now more efficient as well. 2. New NC Format Engine: Redesigning the NC Format (posting) engine to give users customization with nested macro inserts was a priority for the new release. Customized post variables can be used with proper text descriptions and help text. 3. Geometry Management View: When users manipulate part, fixture and stock geometry, the 3D view will now remain interactive because these actions will now be done through the Pallet View. 4. Improved Kinematic Options: For 3-axis paths, the more control the user gets over the C-axis, the better. This improvement allows users to select tilt directions automatically, giving them the ability to take a 3+2 axis path and minimize or maximize its XYZ locations. 5. Error Analysis Navigator: This feature allows users to take each program, check on the simulation status and immediately navigate to any error locations. Users can teleport right to any problems and fix them. The software will be available in the coming weeks. CAMplete TruePath 2018 is slated for an official launch that will take place during EMO Hannover 2017, happening in Germany later this month from Sept. 18 to 23.